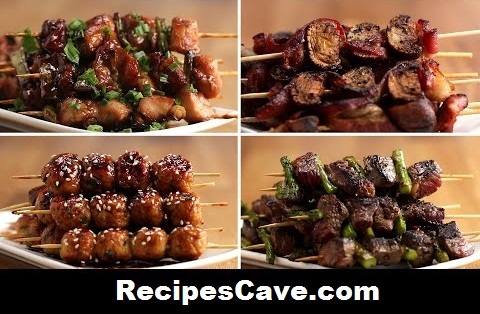 Japanese Grilled Skewers Recipe - Today we are going to know how to cook Japanese Grilled Skewers in 4 Ways. Here is what you'll need. In a medium pot, combine all ingredients and bring to a boil until the bubbles start to become sticky and glossy. Skewer 3-4 pieces of chicken and green onions in an alternating pattern on a bamboo skewer. Repeat with remaining chicken & onions. Sear 3-4 skewers at a time and flip when the undersides are golden brown. Brush the glaze on the skewers evenly and cook for about 4 more minutes, flipping every minute and glazing occasionally. Cool, then serve with additional green onions on top! Thread one end of the bacon onto the end of a skewer. Add a mushroom half, and weave the bacon around the mushroom and back through the skewer, creating a wave pattern between the mushrooms. Move the bacon and the mushrooms down the skewer, repeating until the other edge of the bacon is threaded through. Repeat with remaining bacon and mushrooms. Sear 3-4 skewers at a time, seasoning with salt and pepper, and flip when the undersides are golden brown. Season the other side with salt and pepper and cook until bacon is as crispy as you’d like. Combine the ground chicken, green onions, ginger, sesame oil, and ¼ cup of the soy glaze in a bowl until evenly mixed. If the mixture does not hold its shape when rolled into a ball, add ¼ cup of panko bread crumbs, mix evenly, and re-roll the meatballs to test their structural integrity. Roll about 1-inch meatballs, then skewer 3-4 meatballs on a skewer. Repeat with remaining mixture. Brush the glaze on the skewers evenly and cook for about 5 more minutes, flipping every minute and brushing additional glaze as necessary. Sear 3-4 skewers at a time, seasoning with salt and pepper, and flip when the undersides are a dark brown. Season the other side with salt and pepper, and cook for about 1 more minute.